1 The fool says in his heart, There is no God. They corrupt and make abominable their iniquity; There is no one doing good. 2 God looketh down from heaven upon the sons of men, To see if there is any having discernment seeking after God. 3 Each of them is turned aside; together they are become putrid; There is no one doing good; There is not even one. 4 Do the workers of iniquity not know Who devour my people [as] they devour bread? On God they do not call. 5 There they feared a [great] fear, where no fear was: For God has scattered the bones of him that encamps against thee; Thou hast put them to shame; for God has rejected them. 6 Oh that the salvations of Israel were come out of Zion! When God brings back the captivity of His people, May Jacob exult, may Israel be glad! In this psalm we have an Elohistic recast of Psalm xiv., differing from its original in substituting Elohim for Jehovah (four times) and in the language of ver. 5. There are also other slight deviations not affecting the sense. 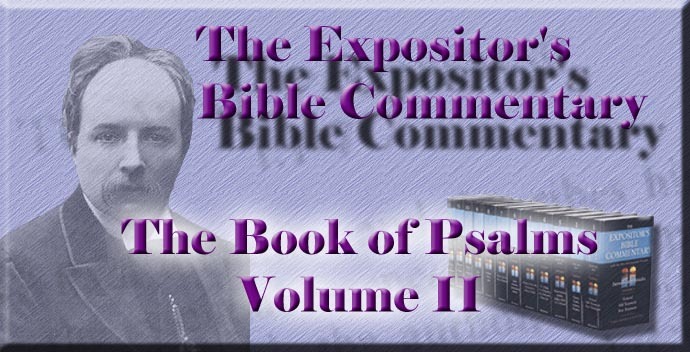 For the exposition the reader is referred to that of Psalm xiv. It is only necessary here to take note of the divergences. The first of these occurs in ver. 1. The forcible rough construction "they corrupt, they make abominable," is smoothed down by the insertion of "and." The editor apparently thought that the loosely piled words needed a piece of mortar to hold them together, but his emendation weakens as well as smooths. On the other hand, he has aimed at increased energy of expression by substituting "iniquity" for "doings" in the same clause, which results in tautology and is no improvement. In ver. 3 the word for "turned aside" is varied, without substantial difference of meaning. The alteration is very slight, affecting only one letter, and may be due to error in transcription or to mere desire to emend. In ver. 4 "all," which in Psalm xiv. precedes "workers of iniquity," is omitted, probably as unnecessary. The most important changes are in ver. 5, which stands for vv. 5 and 6 of Psalm xiv. The first is the insertion of "where no fear was." These words may be taken as describing causeless panic, or, less probably, as having a subjective reference, and being equal to "while in the midst of careless security." They evidently point to some fact, possibly the destruction of Sennacherib's army. Their insertion shows that the object of the alterations was to adapt an ancient psalm as a hymn of triumph for recent deliverance, thus altering its application from evil-doers within Israel to enemies without. The same purpose is obvious in the transformations effected in the remainder of this verse. Considerable as these are, the recast most ingeniously conforms to the sound of the original. If we could present the two versions in tabular form, the resemblance would appear more strikingly than we can here bring it out. The first variation--i.e., "scatters" instead of "in the generation"--is effected by reading "pizzar" for "b'dhor," a clear case of intentional assonance. Similarly the last word of the verse, "has rejected them," is very near in consonants and sound to "his refuge" in Psalm xiv. 6. The like effort at retaining the general sound of the earlier psalm runs through the whole verse. Very significantly the complaint of the former singer is turned into triumph by the later, who addresses the delivered Israel with "Thou hast put them to shame," while the other psalm could but address the "fools" with "Ye would put to shame the counsel of the afflicted." In like manner the tremulous hope of the original, "God is his refuge," swells into commemoration of an accomplished fact in "God has rejected them." The natural supposition is that some great deliverance of Israel had just taken place, and inspired this singular attempt to fit old words to new needs. Whatever the historical occasion may have been, the two singers unite in one final aspiration, a sigh of longing for the coming of Israel's full salvation, which is intensified in the recast by being put in the plural ("salvations") instead of the singular, as in Psalm xiv., to express the completeness and manifoldness of the deliverance thus yearned for of old, and not yet come in its perfection. Italics show variations from text of Psalm xiv.